This latte bend comes in a powder and makes 24 cups. Featuring a refreshing & uplifting blend of cacao with pure mint oil, simply mix blend with water, coconut, almond, soy or rice milk to create the beverage. Founded in 2002, Jomeis Fine Foods is an Australian brand based in Victoria. Their core belief is that food has the ability to nurture and heal. With this in mind they have created seven innovated nutritional lattes blends. These beverage blends with a nutritious kick, are all 100% natural and 100% plant based, and are free from dairy, gluten, sugar, soy, artificial colours, flavours and preservatives. 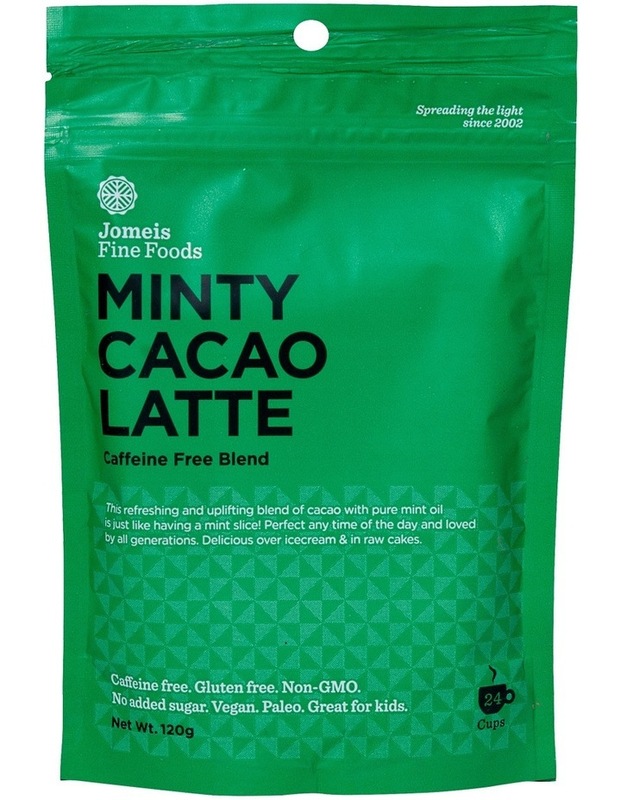 So much more than just a beverage, Jomeis Fine Foods nutritional lattes can also be used as a key ingredient in a great range of healthy recipes, such as bliss balls, raw cakes, cereal, and yoghurt toppings. Made in Australia from imported ingredients.